$15 Gourmet Chicken Parmy night from 5:30pm until 8:30pm with free Jukebox and pool all night. Book your table for lunch before Friday 23rd March & we will waive the 15% public holiday surcharge all your total bill. We open the doors for lunch only on Good Friday. Open from 10:30am to 2:30pm for lunch and bookings are essential. (07) 5563 9433. Full menu available and we will have seafood specials on the day available from our specials boards including $39 seafood plates with prawns, grilled fish and other seafood delicacies. Easter Egg Hunt for the kids starting at 11:30am in the family room. Kids Eat Free Saturday night for dinner from 5:30pm until 8:30pm. (T&C’s apply). 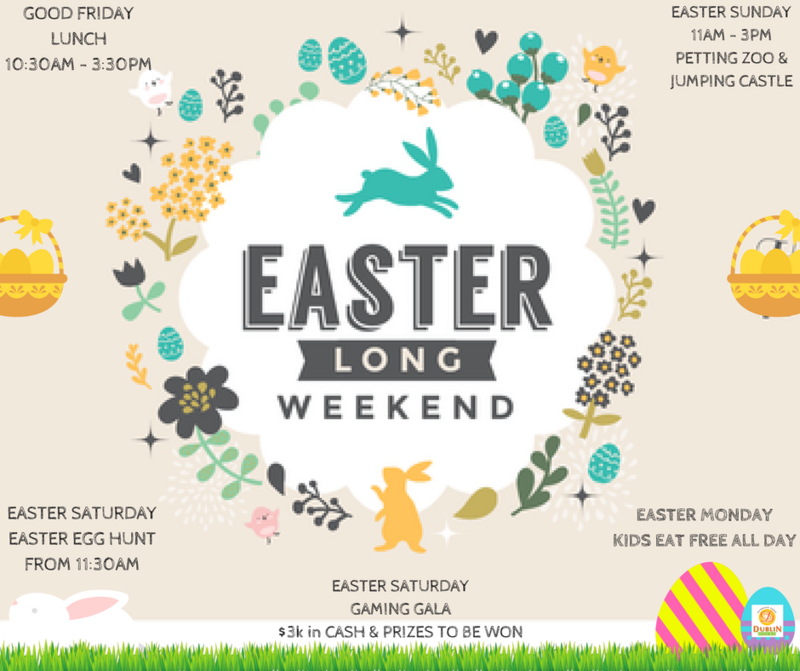 Easter Eggstravaganza Gaming Gala 5pm-6pm – free nibbles and complimentary bubbles in the gaming room. $3k in cash and prizes to give away. (T&C’s apply) plus all day dining from 11:30am until 8:30pm. Celebrate Easter with the family as we give you a complimentary Petting Zoo and Jumping Castle for the kids between 11am and 3pm plus All day dining from 11:30am until 8:30pm. Kids Eat Free from 11:30am until 8:30pm plus all day dining from 11:30am until 8:30pm. (T&C’s apply). Your Easter Long Weekend celebrations start and end at The Dublin Docks Tavern where there is something for the whole family. (07) 5563 9433.